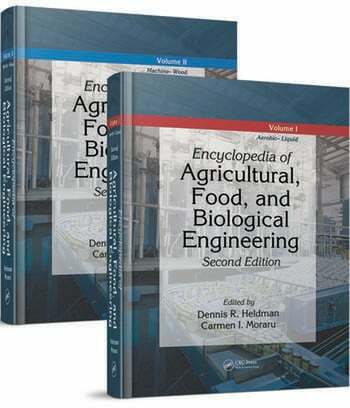 The Second Edition of the Encyclopedia of Agricultural, Food, and Biological Engineering focuses on the processes used to produce raw agricultural materials and convert the raw materials into consumer products for distribution. It provides an improved understanding of the processes used in the production and manufacture of consumer products of agricultural origin. With more than 400 entries, the encyclopedia examines the processes used to convert raw materials info safe, convenient, and nutritious foods as well as the many other consumer products manufactured from raw agricultural materials. In addition to completely new entries based on new developments in the field, this second edition provides updates to existing entries. The encyclopedia emphasizes the significant role of engineering in the development and design of the processes and equipment for the production and manufacturing of products of agricultural origin. The entries expand on the original concepts and introduce many new topics based on the evolution of developments in agricultural production, the conversion of raw materials into food products and the biological processes used throughout the system. The second edition continues to address critical components of a system with the capacity to deliver food and other consumer products to an expanding world population. This encyclopedia provides the knowledge necessary for readers to contribute to the safety and nutrition of the global food supply as well as the other products that contribute to a quality of life for consumers. Dennis R. Heldman speaks about his book on the CRC Press YouTube Channel. de Kruijf, N.; van Beest, M. D.
Fox, Robert D.; Derksen, Richard C.
Macaloney, Graeme; Montague, Gary A.
Álvarez, Pedro M.; Beltrán, Fernando J., García-Araya, Juan F.
Hughes, Kerry L.; Christy, Ann D.
De Corcuera, José I. Reyes; Cavalieri, Ralph P.
De Corcuera, José I. Reyes; Cavalieri, Ralph P.; Powers, Joseph R.
Bhatnagar, Sandeep; Hanna, Milford A.
Rodrigues, R. B.; Cabral, L. M. C.; Menezes, H. C.; Matta, V. M.; Dornier, M.
Kozempel, Michael F.; Tomasula, Peggy M.
Raghavan, G. S. V.; Gariépy, Y.; Vigneault, C.
Ranjan, Rakesh; Reddy, J. N.
Taylor, Timothy A.; Kramer, Heather L.
Rausch, Kent D.; Belyea, Ronald L.; Singh, Vijay; Tumbleson, M. E.
Fagan, C. C.; O’Donnell, C. P.
Krokida, M.; Gekas, V.; Maroulis, Z. B.
Yang, Wade; Siebenmorgen, Terry J.
Kerkhof, Piet J. A. M.
Vidal-Broto´ns, D.; Fito, P.; Gras, M.
Hatfield, J. L.; Prueger, J. H.
Levine, Leon; Miller, Robert C.
Raghavan, G. S. V.; Sanga, E. C. M.
van Sleeuwen, Rutger M. T.; Heldman, Dennis R.
Nicolaï, Bart M.; Hertog, Maarten L. A. T. M.; Ho, Quang T.; Lammertyn, Jeroen; Verboven, Pieter; Verlinden, Bert E.
Barron, Felix H.; Burcham, Joel D.
Casady, William W.; Adamchuk, Viacheslav I.
Góngora-Nieto, M. Marcela; Barbosa-Cánovas, Gustavo V.
López-Rubio, Amparo; Lagarón, J. M.; Catalá, R.; Gavara, R.
Rodrigues, Evangelina T.; Han, J. H.
Barnes, Edward M.; Hunsaker, Douglas J.
Guiavarc'h, Yann P.; Van Loey, Ann M.; Claeys, Wendie; Hendrickx, Marc E.
Dickson, Monte; Reid, John F.
Martín, Fernanda San; Harte, Federico; Barbosa-Cánovas, Gustavo V.; Swanson, Barry G.
Smerage, Glen H.; Teixeira, Arthur A.
Teixeira, Arthur A.; Smerage, Glen H.
Kim, Yunseop; Reid, John F.
Hahn, John J.; Jacoby, William A.
Chao, K.; Ting, K. C.
Niemira, Brendan A.; Sommers, Christopher H.
Taghizadeh, Masoud; Gowen, Aoife; O'Donnell, Colm P.; Cullen, P. J.
Stine, Rory; Pishko, Michael V.
Muthukumarappan, K.; O'Donnell, Colm P.; Cullen, P. J.
Steven, Matthew D.; Hotchkiss, Joseph H.
Ramaswamy, H. S.; Awuah, G. B.; Chen, C. R.
de Marañón, I. Martínez; Pérez, I.
Chinnan, Manjeet S.; Cha, Dong S.
DeWitt, Christina A. Mireles; Morrissey, Michael T.
Ramaswamy, Raghupathy; Balasubramaniam, V. M.; Sastry, S. K.
Stoner, Michael R.; Randolph, Theodore W.
Sepúlveda, David R.; Barbosa-Cánovas, Gustavo V.; Swanson, Barry G.
Awuah, George B.; Economides, Athanasia; Ramaswamy, Hosahalli S.
Ghosh, Vikram; Anantheswaran, R. C.; Floros, John D.
Siebenmorgen, Terry J.; Cooper, Nora T. W.
Bakalis, Serafim; Hoonstra, Erik; Taoukis, Petros S.
van Boekel, Martinus A. J. S.
Oliveira, Fernanda A. R.; Oliveira, Jorge C.
Bower, C. K.; McGuire, J.; Bothwell, M. K.
Izuno, Forrest T.; Garcia, Raymond M.
Wang, S.; Tang, Juming; Younce, F.
Knoerzer, K.; Regier, M.; Schubert, H.
Choi, Yonghee; Okos, Martin R.
Verboven, Pieter; Scheerlinck, Nico; Nicolaï, Bart M.
Rahman, M. Shafiur; Sablani, Shyam S.
Feng, Hao; Martin, Scott E.
Ghosh, Vikram; Anantheswaran, R. C.
Welti-Chanes, J.; Vergara, F.; Bermúdez, D.; Mújica-Paz, H.; Valdez-Fragoso, A.
Ozen, Banu F.; Singh, Rakesh K.
ER - AU - Glancey, James L.
Cullen, P. J.; O'Donnell, C. P.
Yildiz, M. Erhan; Kokini, Jozef L.
Harper, David P.; Rials, Timothy G.
DENNIS R. HELDMAN is currently Principal, Heldman Associates in San Marcos, California. In addition, he is Adjunct Professor at the University of California-Davis and Professor Emeritus at the University of Missouri. Previously, Heldman has been Director of the Cooperative Research and Development Program at the Center for Advanced Food Technology and Professor of Food Process Engineering, Rutgers University, New Brunswick, New Jersey. The author, coauthor, editor, or coeditor of numerous professional publications, including the Handbook of Food Engineering (Marcel Dekker, Inc.), he is a member of the Institute of Food Technologists, the American Society of Agricultural Engineers, the Institute of Biological Engineering, the American Institute of Chemical Engineers, and the American Association of Cereal Chemists, among other organizations. Professor Heldman currently serves on the Scientific Advisory Council for the World Food Logistics Organization. The scope has expanded to include new processes developed at the micro- and nanoscales, applications of new sensory technologies, and sustainability issues related to food and agricultural security. Readers do not need extensive technical backgrounds in order to understand the articles, written by experts from around the world. Useful illustrations, graphs, and formulas continue to enhance the narrative entries. In addition to an excellent index and alphabetical table of contents, a topical table of contents groups articles across both volumes under agricultural, biological, and food engineering taxonomies. ... Summing Up: Recommended. Lower-level undergraduates and above; general readers. The concept of a reference on this field of engineering is an important step in recognizing the importance of not only engineers but all scientists in the food and agricultural industries. … a valuable resource [for] any library in our field. … covers a wide ranging set of technical topics and contemporary perspectives. 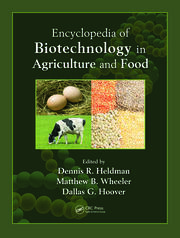 … one of the best encyclopedias I have seen in the area of agricultural, food and biological engineering. Dr. Heldman is to be commended. … an exhaustive, in-depth and professionally thorough resource. This is the first publication to bring together authoritative information in this discipline … highly recommended. … articles are carefully written and peer-reviewed … this title fills an existing need. I would recommend it to public, academic, special libraries with programs in agriculture, engineering, and food science.